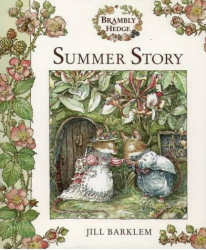 The Brambly Hedge series of illustrated books for children were written by Jill Barklem. Pictured right: Brambly Hedge Miniatures from Hantel. This collection of handpainted, jointed pewter miniatures was faithfully reproduced by Frances Wilson after Jill Barklem’s breathtakingly detailed illustrations. They were produced for just a short period and are very collectable. The first four books followed the adventures of a hedgerow coummunity through the seasons, were published in the autumn of 1980 and were an immediate success. The books follow the story of Primrose Woodmouse, Wilfred Toadflax, their families and their friends. Jill Barklem had spent five years on research before she started to write her first stories about the mice of Brambly Hedge and her interest inNatural History and her curiosity about traditional rural customs and crafts have spilled over into these chronicles of hedgerow life. Pictured left: An early edition of Summer Story by Jill Barklem. Good quality first editions of the first series of books sell for around £20.00/$35.00. 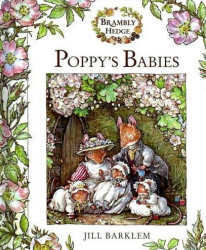 Pictured right: The latest Brambly Hedge story Poppy’s Babies published in 1994 is also one of the most collectable. A near mint quality first edition sells for around £45.00/$80.00. Since the original publication of the first series of books, four new books have been published The Secret Staircase (1983), The High Hills (1986), Sea Story (1990) and Poppy’s Babies (1994). The stories have been translated into many languages and all the books have been adapted for televsion. 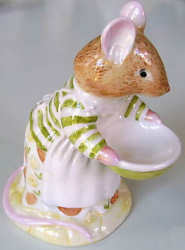 Pictured left: A Royal Doulton Brambly Hedge figurine called Mrs Toadflax DBH11. 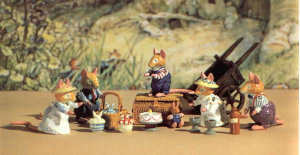 The characters and mice of Brambly Hedge have now appeared on merchandise ranging from china to chocolate, and from enamel boxes to pewter miniatures. 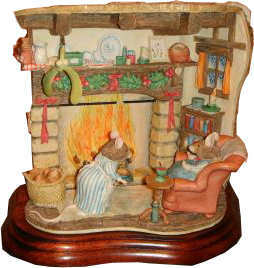 Companies such as Hantel, Border Fine Arts, Crummles and Royal Doulton have all produced collectable pieces licensed from Brambly Hedge.